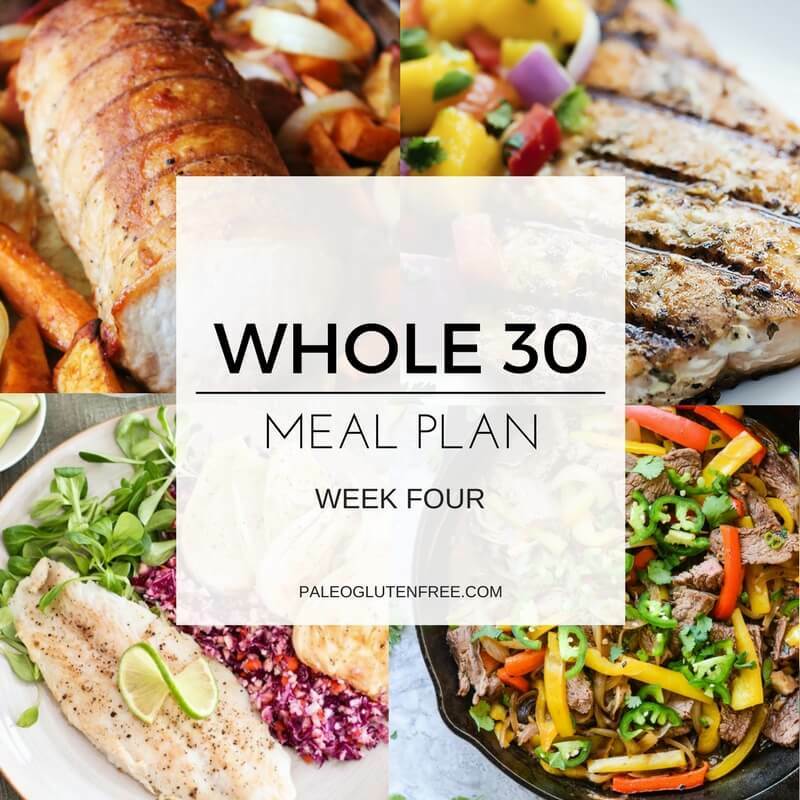 Find all the meals you could ever need in this all inclusive whole 30 meal plan! 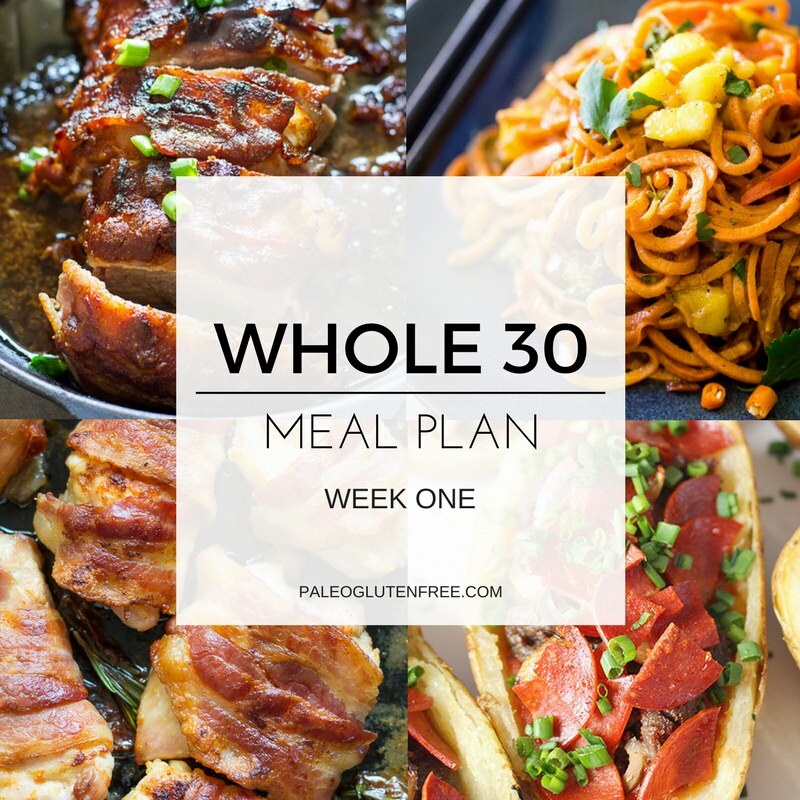 30 days of breakfast, lunches, and dinners all planned out for you. 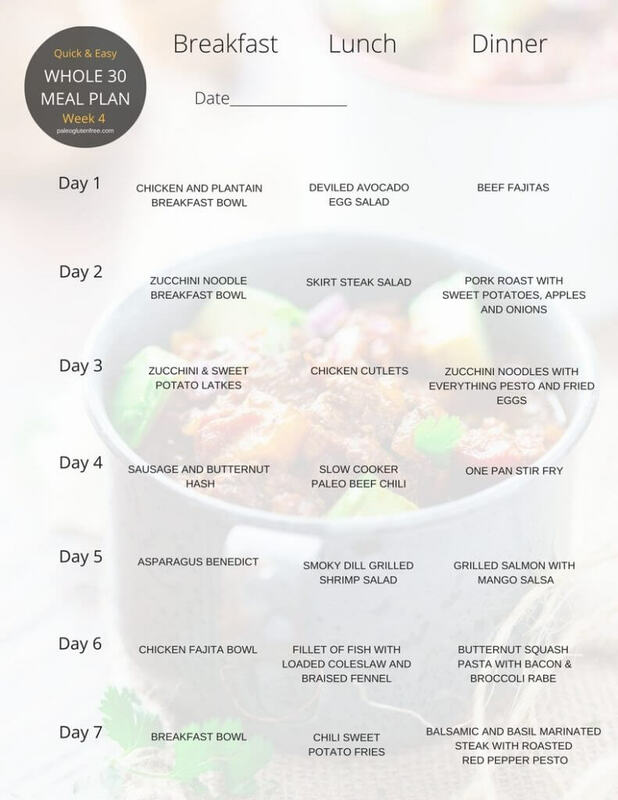 Includes a printable menu and week by week plans. 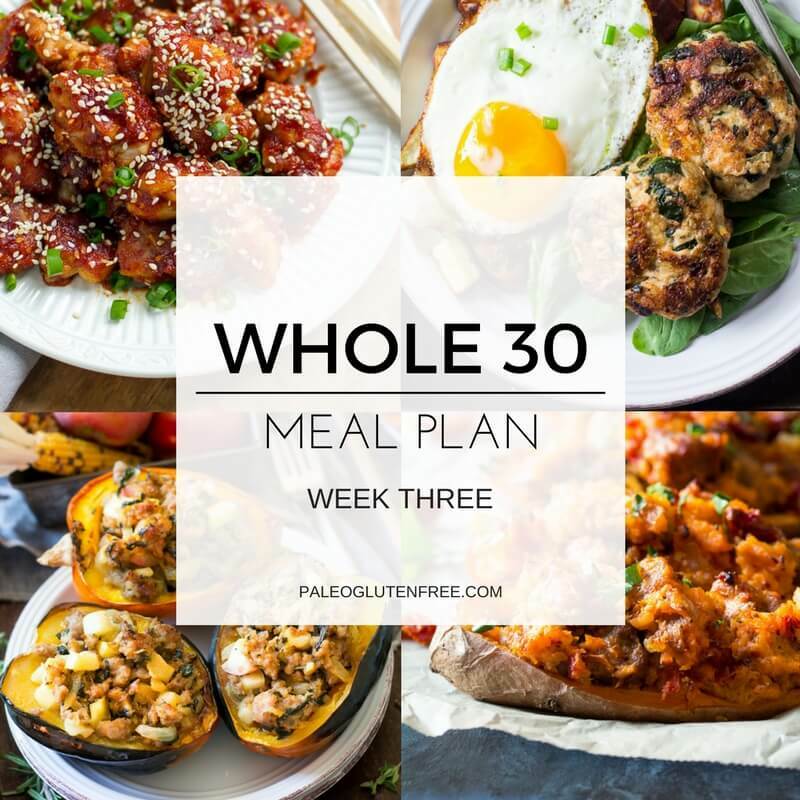 Below are links to week one, two, and three of this whole 30 meal plan. Be sure to download and print out this weeks menu, so you can stay prepared. Enjoy! 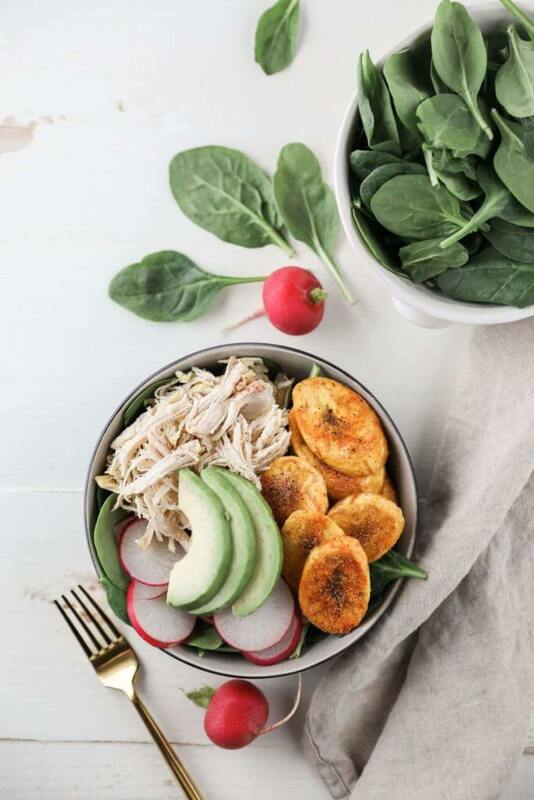 This Chicken and Plantain Breakfast Bowl is one of our favorite things to eat for breakfast. Several years ago when I first changed my diet I was quite perplexed on what to eat that didn’t include a ton of bread, grains and sugar. 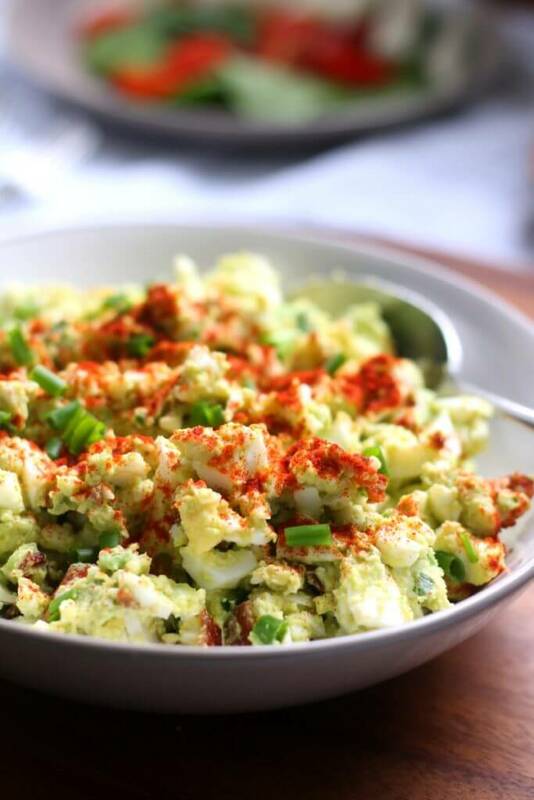 Savory, healthy and simple egg salad with no mayo that’s Paleo and Whole30 friendly! This Deviled Avocado Egg Salad is smoky, creamy, and perfect for easy lunches, picnics, barbecue season. Dairy free, & soy free. 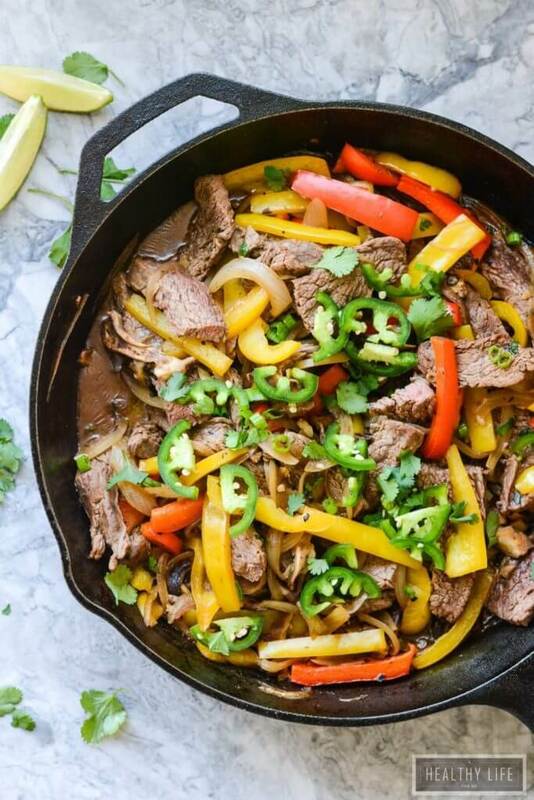 Paleo Skillet Beef Fajitas is a one pot dinner dynamo, with flavors of sautéed peppers, onions, mushrooms and perfectly seasoned and seared steak. Ready in under 30 minutes. 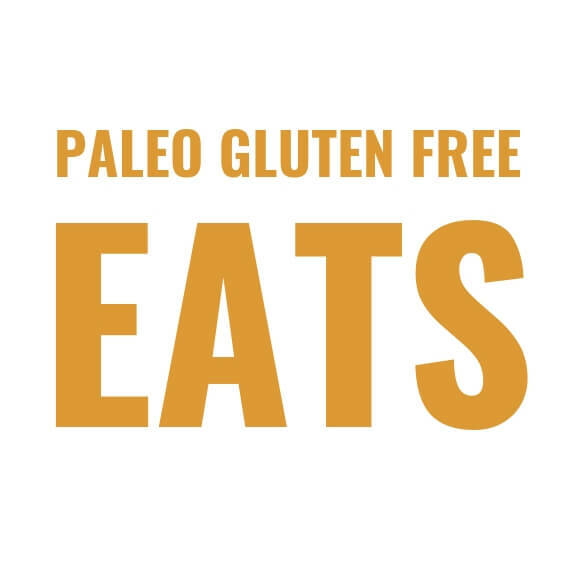 Paleo, gluten-free, dairy-free and whole30 friendly recipe. 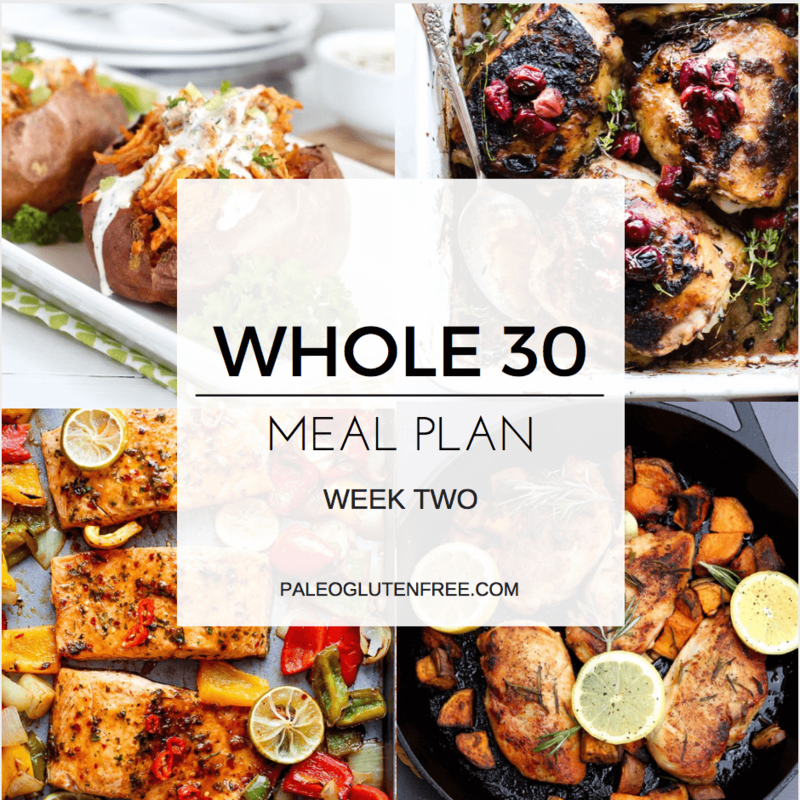 Looking for a healthy, Whole 30 meal? 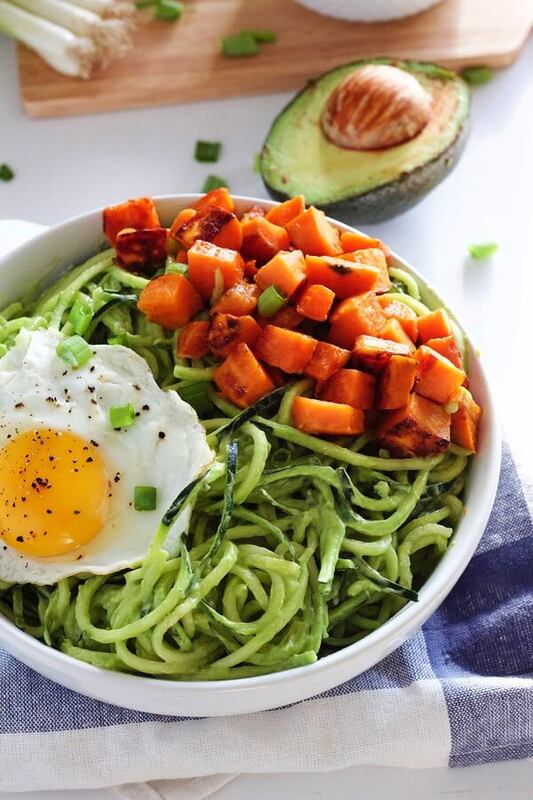 This Zucchini Noodle Breakfast Bowl features zucchini noodles covered in an avocado cream sauce and topped with roasted sweet potatoes and a fried egg. 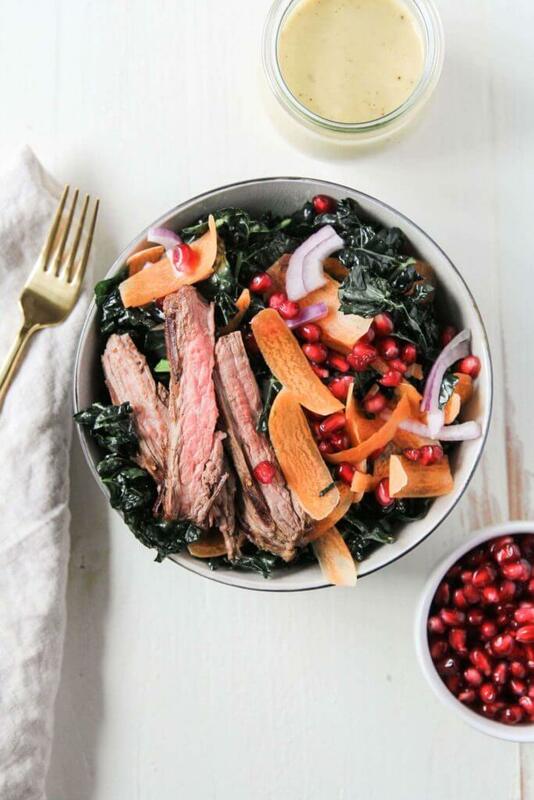 I am really excited to share this Skirt Steak Salad Bowl with you all. 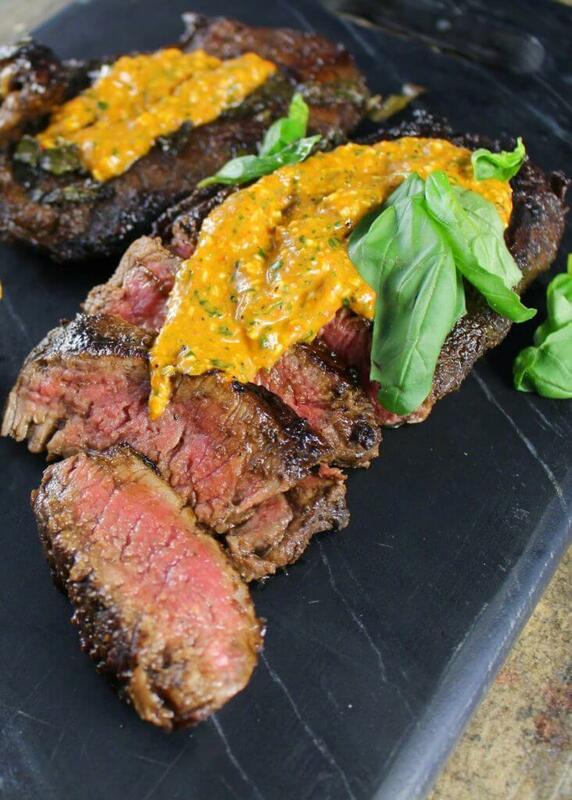 I seriously couldn’t believe how incredibly easy and delicious this recipe was. My husband was out of town when I made it and I got to enjoy it for several meals. 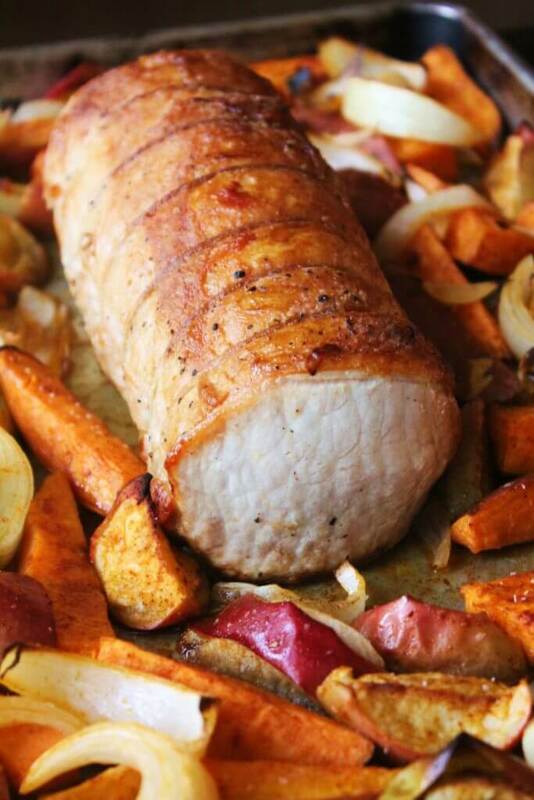 This impressive meal is a one pan wonder… my favorite way to prepare a meal. Did I mention it is ready to eat in 1 hour! Fresh fall ingredients make this seasonal and delicious. 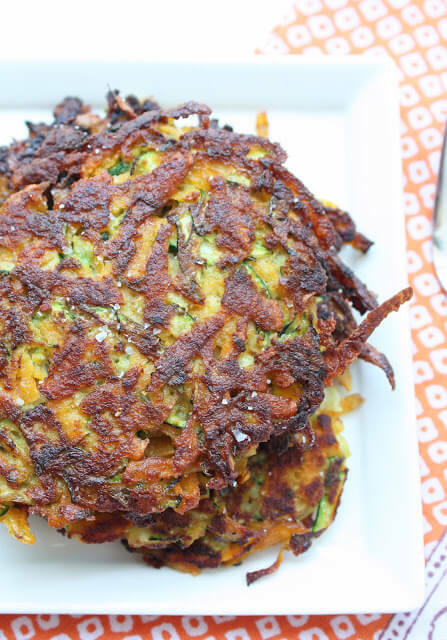 Delicious latke recipe that is totally Whole 30 compliant! These were easy to make and SO tasty! Crispy on the outside and sweet and slightly starchy on the inside. 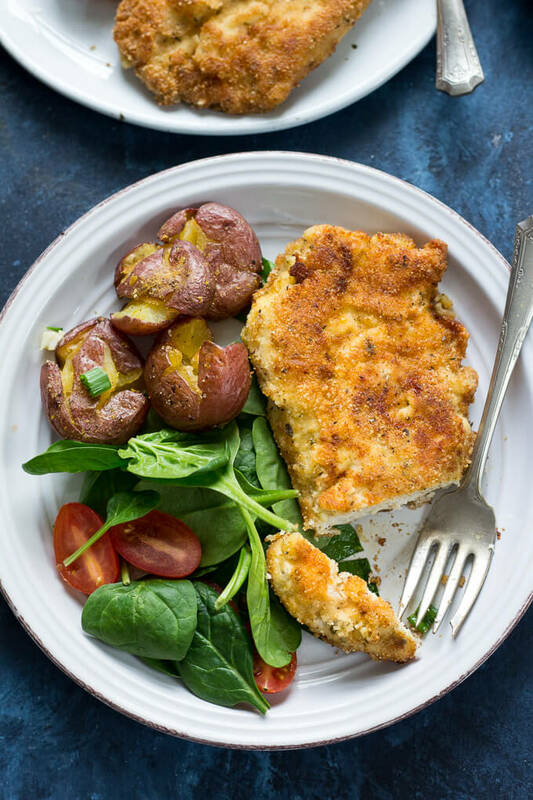 My family’s favorite “breaded” Paleo Chicken Cutlets that are super easy, quick, and just as good as the original. 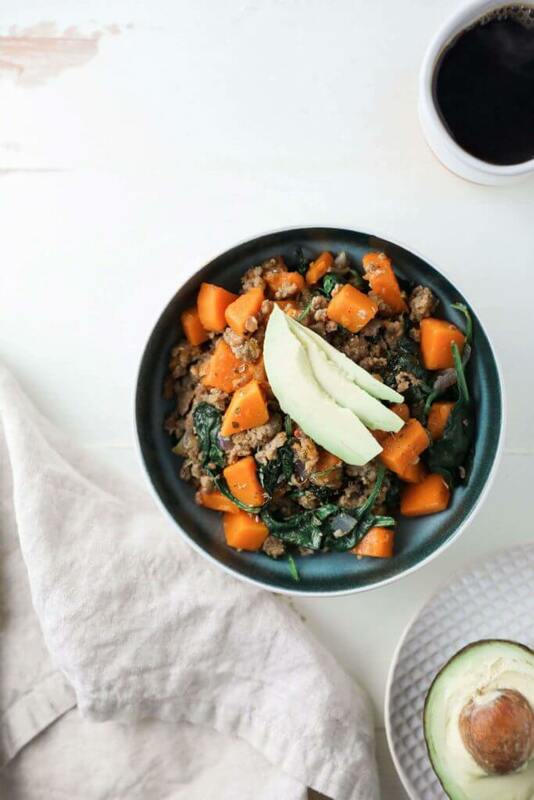 Whole30 compliant and kid friendly – you can put these on you “go-to” dinner list! We eat hash for a lot of meals but breakfast is one of my favorite times to eat this delicious and hearty dish. This recipe is perfect for these cold winter months and it utilizes seasonal vegetables so that is definitely a win. 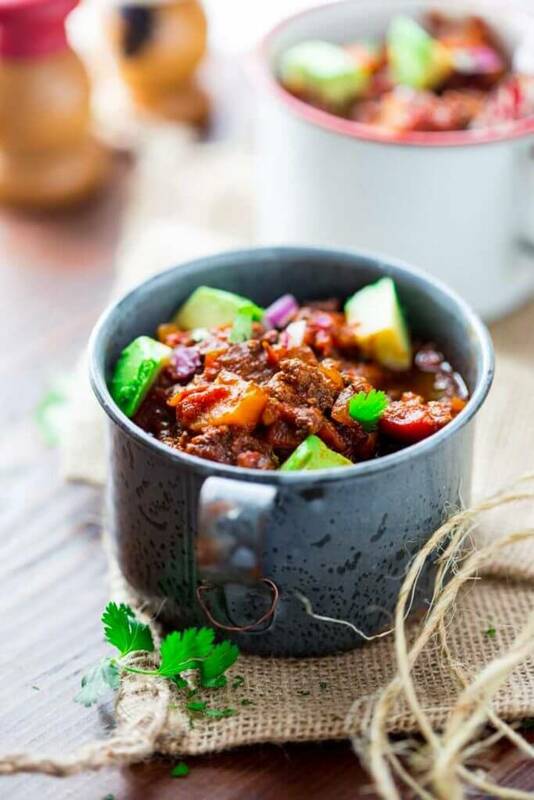 This paleo beef chili is not only easy to make in the slow cooker, but also full of flavor! Loaded with sweet potatoes, beef, spices, tomatoes, and more. It’s whole 30 friendly and quick to prep. 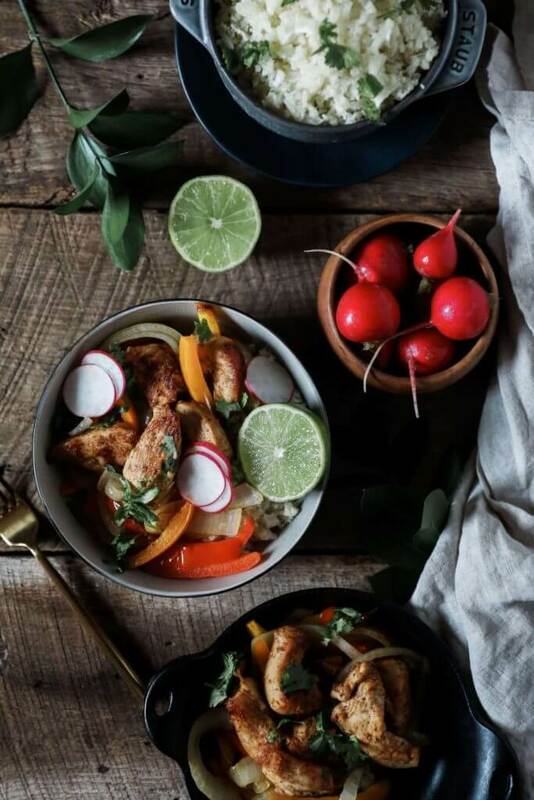 An easy Whole 30 compliant stir fry. 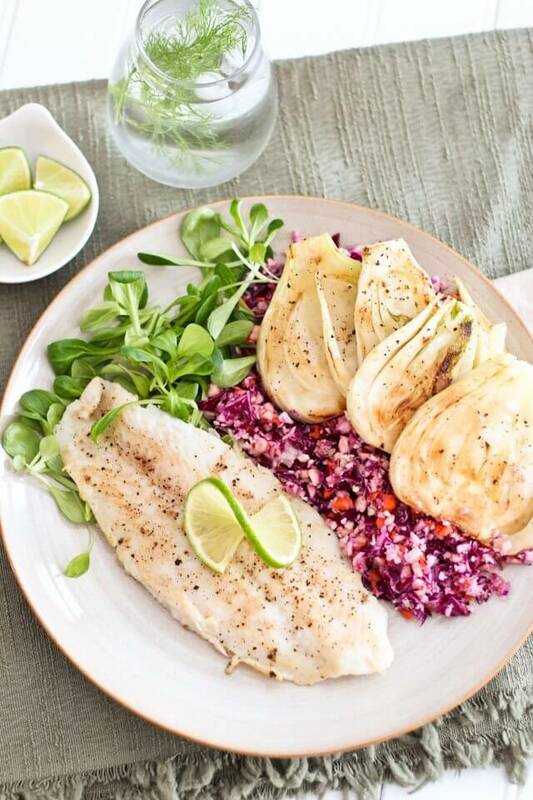 Make eating a healthy dinner easy!! 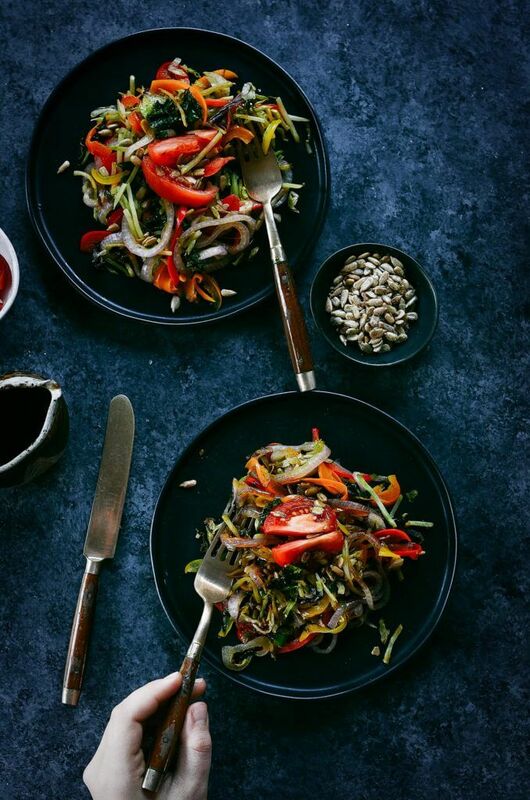 This colorful and simple stir fry is made with only paleo ingredients and takes only a few minutes to whip up! I have a super scrumptious breakfast recipe to share with you. 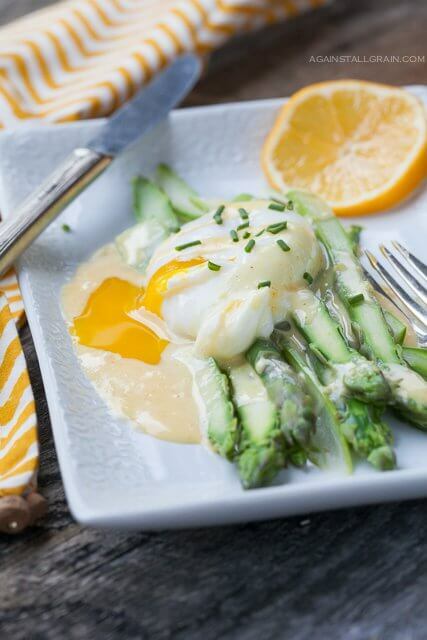 Poached asparagus and eggs topped with my favorite condiment: hollandaise sauce. 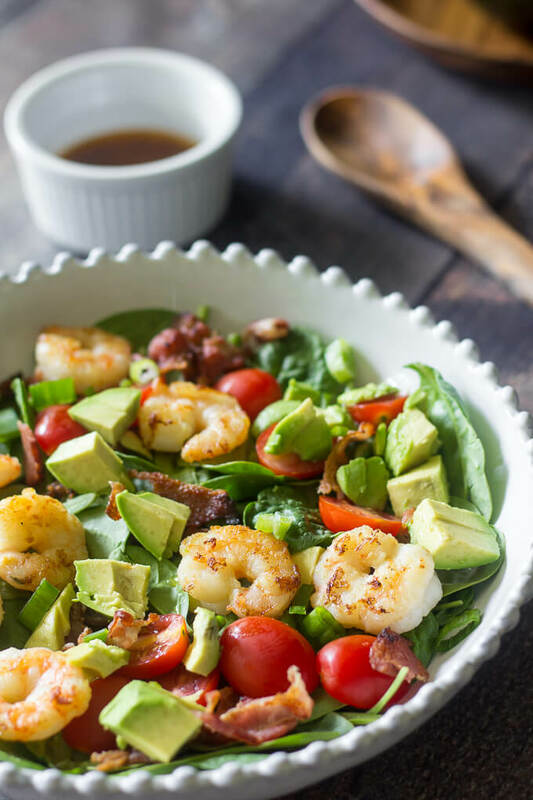 A healthy grilled shrimp salad with avocado, bacon and tomatoes with a savory, smoky dill sauce made with ghee or grass fed butter. 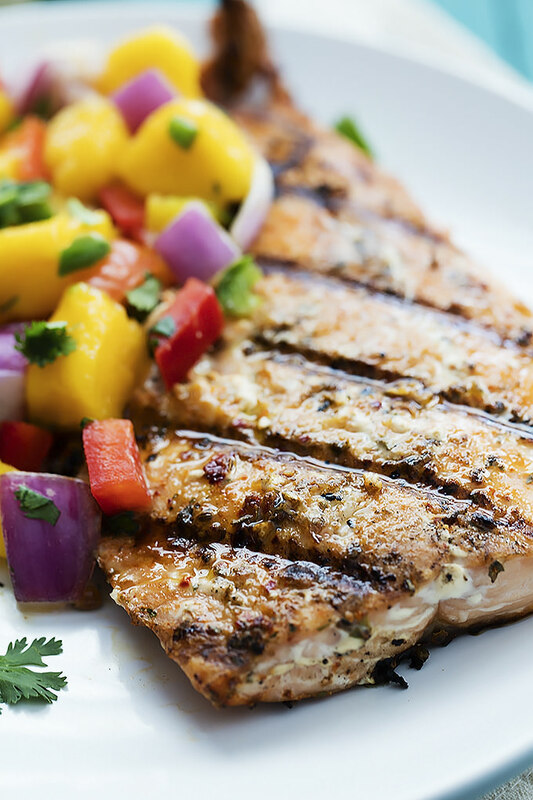 Grilled Salmon with Mango Salsa – perfectly grilled flaky pink salmon topped with sweet and spicy mango salsa. Chicken Fajita Bowls need to become a daily occurrence in my life. Oh man, this recipe is insanely good. I have been making fajitas for years but have never written down the recipe or tried to fine-tune it. I had a hard time finishing my plate, but it was so good and I felt so excited that I was finally getting somewhere and had been able to create a real decent meal that was Whole30 compliant. 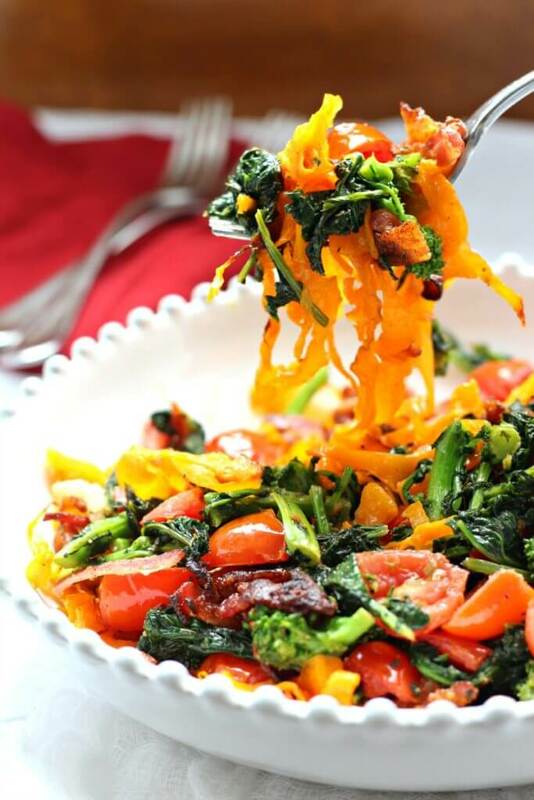 Sweet and Savory Roasted butternut squash noodles are tossed with crispy bacon, broccoli rabe and tomatoes for a delicious Whole30 friendly grain free and Paleo Butternut Squash Pasta dish! Are you looking for a breakfast to keep you full and energized? 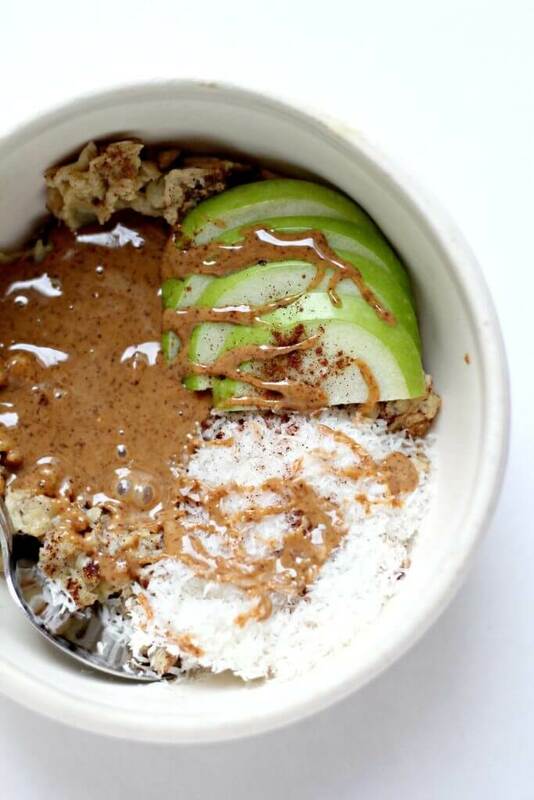 This Whole30 Breakfast Bowl will do just the trick! 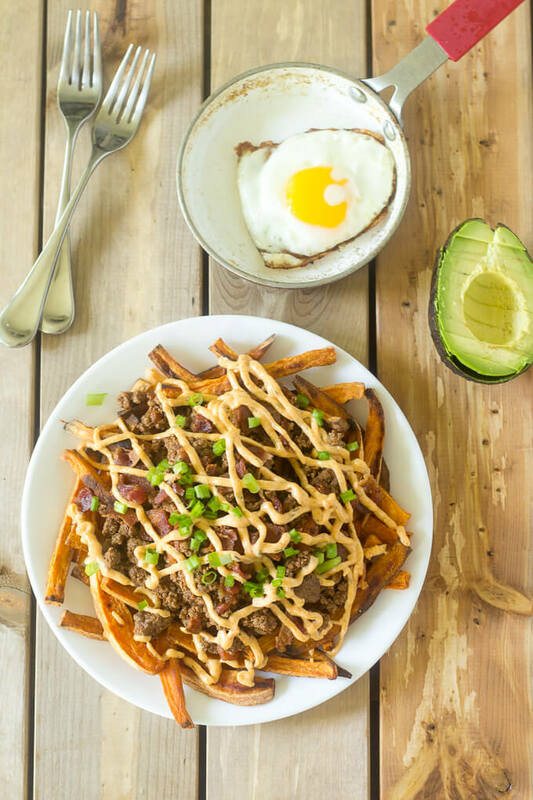 Crispy, savory baked sweet potato fries loaded with everything you crave! Savory chili made with ground bison or beef, bacon, avocado. 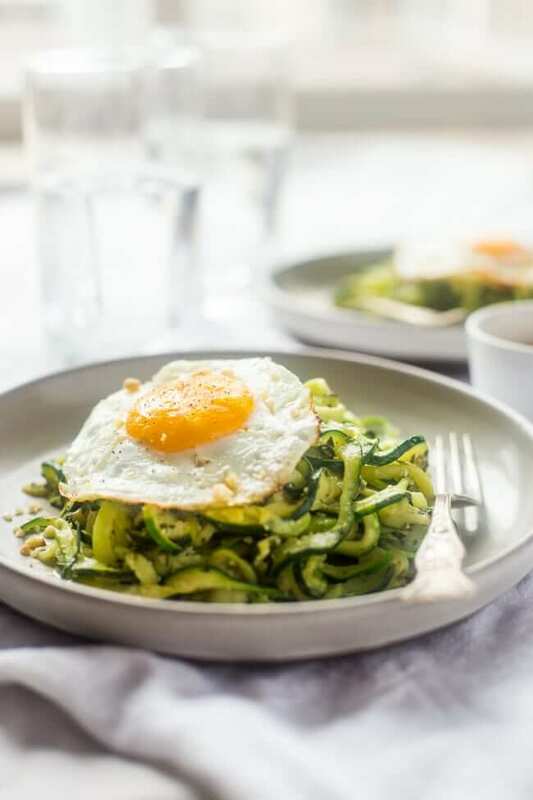 I love this recipe because it’s so fancy pants and flavorful, you will never feel like you are doing some kind of detox or elimination diet. I thought maple syrup isn’t whole 30 compliant. any way to make the cranberry chicken without it ? Hi Marisa! Yes! There are notes to sub the maple syrup with this homemade date syrup: https://paleoglutenfree.com/recipes/dreamy-2-ingredient-whole30-date-syrup/ Hope that helps!